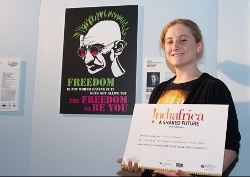 On Friday, 17 May 2013 the winners of the 2nd INDIAFRICA Poster Design Competition were announced at the Faculty of Art, Design and Architecture (FADA), University of Johannesburg (UJ). The theme of the exhibition was ‘What freedom means to you’ and featured a few posters from ‘Ghandhi at Tahrir Square. The Poster Design Contest was organised jointly by the Indian Embassy in Cairo and INDIAFRICA. INDIAFRICA: A shared future is a unique collaborative project that is building bridges between the two very diverse cultures of Africa and India. It engages young people across the two regions through contests, fellowships, collaborative projects, internships, events and cultural exchanges. The programme is multifaceted, in that though it focuses on the youth. It also helps build an ecosystem with multiple stakeholders such as institutions, organisations, think-tanks, corporates and governments. This year, three of the winners of the 2nd INDIAFRICA Poster design Competition were from FADA who each won a cash prize to the value of R9 000. They were Nicola Helmann, Telita Esterhuizen and Lerato Bosoga. 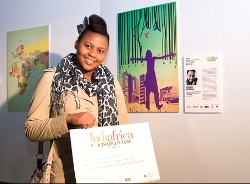 INDIAFRICA POSTER DESIGN WINNER: Lerato Bosoga. 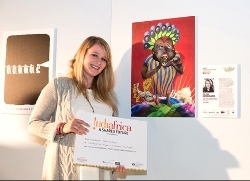 INDIAFRICA POSTER DESIGN WINNER: Telita Esterhuizen.